City Sports Club is located onsite and features a pool, state-of-the-art equipment, locker facilities, personal trainers, kids club and parking. Less than 5 minutes along the Greenway, lies Berkeley Bowl, an organic grocery store and café. Whether you need to fill the refrigerator or pick up a quick lunch Berkeley Bowl is minutes away. Easy access for bike commuters to enter the building off the greenway and secure their bikes in the bike lockers located in the basement. 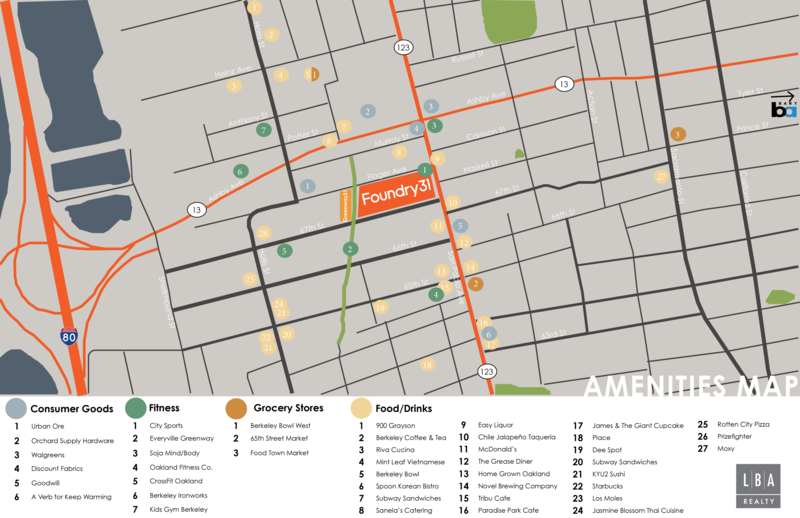 At Foundry31 there is ample secured rooftop and basement level parking.